French cyclist Warren Barguil has been taken to hospital after suffering a serious injury in a crash during Stage 2 of Paris-Nice. The Team Arkea Samsic rider fractured his 'second cervical vertebrae' in the incident and was taken from the scene in a neck brace to a specialised unit at the Bicetre hospital. The rider also reportedly lost consciousness after his fall and received a CT scan. The crash came on a day of poor weather conditions in the French race, with Maxime Bouet another rider to go down and suffer injuries. 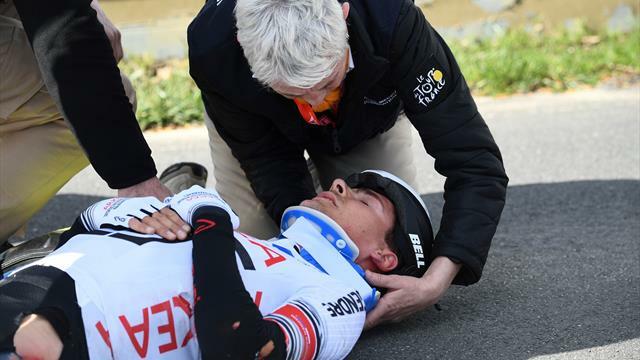 Barguil won the Tour de France King of the Mountains jersey in 2017, but this injury places his participation in the 2019 edition of the race in serious doubt. His team have yet to reveal further information about the crash or extent of the injuries.